I recently noticed that the mouth (hole) to insert the shear core is wide and easy to put in the core is convenient for the ground and is saved. This review is about item#34974992. There is a sense of knocking properly, the thickness is just fine for women's hands. I am also happy that it is affordable to keep stock as equipment. The core breaks as soon as you write with a little effort. I bought five books, but both thrown away because they are not usable together. I purchased a different item at a later date, but I think that it is a defective item because it can be used without problems. This review is about item#34974983. As others review, the core breaks easily. I will break as soon as I am surprised. 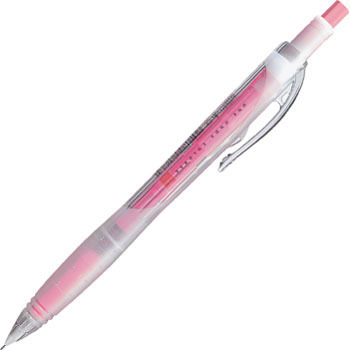 Even if the eraser is long, it can not be used because the lead breaks at once. Writing outside the field etc. Since the eraser is retractable and the cap is not originally, there is no such thing as being bad that the cap is gone. This review is about item#34975017. Anyway the core breaks and does not become usable. I bought it and failed. When I try to write, the core is definitely broken. Anyway the core got popped up and it was tired. I always repeat. Since the eraser of the mechanical pencil is stored in the mechanical pencil body, there is no cap and there is no worry of losing the cap. All of our company 's Flower, this is a loyal user of this pencil. I will repeat in the future. It may be because the core is soft B, but you can break anyway. This review is about item#34975001.